A line of cars waits for parking on March 4 at one of Keystone Ski Resort’s paid lots. Keystone is looking to alleviate parking woes with a set of changes to lots and payment systems this season. Keystone Resort has unveiled its finalized parking plans in advance of its earliest opening day in nearly 10 years. 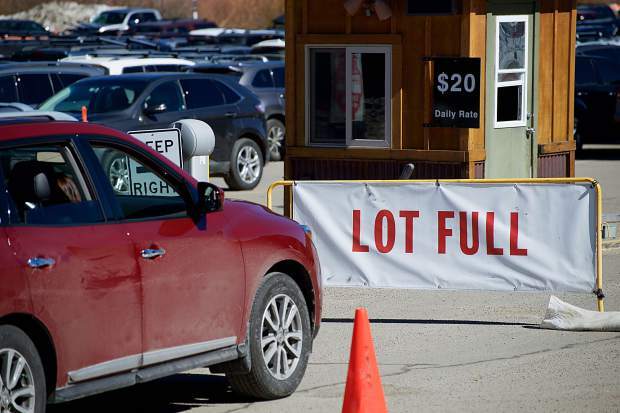 The resort’s parking lots have been notorious for getting full at peak times, leaving guests scrambling to find parking and wasting valuable gnar-shredding time. While parking capacity remains unchanged, Keystone hopes that several changes to the parking process will alleviate some of those parking issues for the 2018-19 season. The River Run Gondola lot, formerly known as the Montezuma lot and containing a majority of the resort’s parking spaces, will remain free every day. Carpooling will continue to be incentivized at the Gondola lot. Families with children younger than 13 or cars with four or more passengers will be prioritized by traffic staff and directed to first-come, first-served spaces up front. One significant change to parking this year is that a formerly free lot is now a paid lot. The Mountain House East E lot, formerly known as the Pika lot, will charge $10 for parking. The other Mountain House base area lots, Mountain House West A, Mountain House West B and Mountain House East D, formerly the Marmot and Porcupine lots, will remain at $20. Paid parking lots servicing River Run Village — Hunki Dori and Gold Bug — will still charge a daily fee of $30. Fees will be in place between 8 a.m. and 2 p.m. and all lots will become free after 2 p.m.
A significant new change is an additional charge for overnight parking at the pay lots. Cars parked overnight between 2 a.m. and 6 a.m. at the pay lots will be charged $20. That cost will be in addition to any fees for parking during the day. Pay lots will be changing from an entry gate system to one involving the Passport Parking app and kiosk system, which is already used in Breckenridge. Guests can park at a space and pay in advance at the kiosk, or install the Passport Parking app and pay remotely on their phone. If the pay lots get full, guests will be shepherded to a different lot or given other instructions on how to park. Stopping to stand in a line for an open spot will not be allowed, but guests can circle around until one opens up, making it effectively a “one-out, one-in” system. The resort will also open two overflow shuttle lots, the Powerline lot and North Shuttle lot, during holidays and weekends to increase capacity. From those areas, guests can take a five-minute shuttle ride to the resort. Russell Carlton, Keystone’s communication manager, said the changes are meant to streamline parking at the resort, as well as improve the guest experience overall. Carlton urged guests to carpool and arrive early to get the most out of their visit. He said parking usually gets full on peak days and weekends between 10 a.m. and noon, so guests should plan ahead to get to the resort before or after that peak period. Carlton also pointed out that Keystone is the only resort that offers night skiing, and guests who get to the resort in the afternoon can stick around and still get a full “day” on the slopes. Additionally, Keystone has a dedicated Twitter account for parking, @KeystoneParking. The feed will provide guests with real-time updates on the parking situation, including which lots are currently open or full.